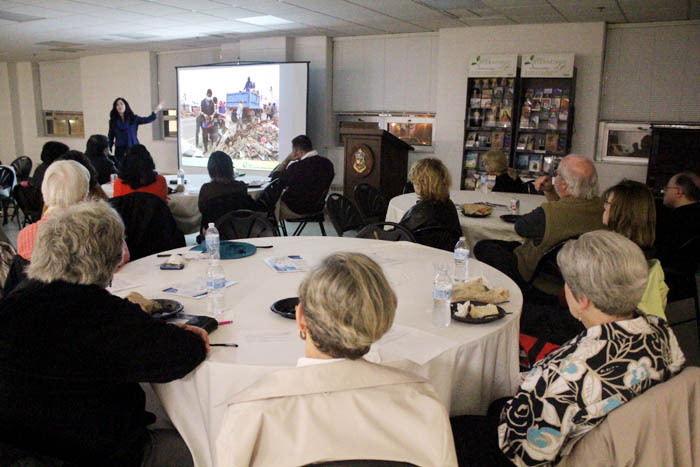 Participants in the seminary’s Vianney Hall listen to Brennan’s presentation. Most residents of the Philippine Islands were not especially worried last November when they were warned a huge typhoon was about to hit. They’d weathered Typhoon Washi in 2011 and Typhoon Bopha in 2012, both of which caused serious damage and loss of life, not to mention a category 7 earthquake in October. Typhoon Haiyan (Yolanda in the Philippines), the full force of which slammed into Samar and Leyte in the central part of the archipelago on Nov. 8, 2013, turned out to be the grand-daddy of all typhoons, which at its peak had winds clocked at 195 m.p.h., the strongest storm ever recorded to hit land anywhere. The real game changer was the added element of a storm surge with towering waves like a tsunami, said Caroline Brennan, a senior communications officer with Catholic Relief Services (CRS) who visited the typhoon area to report on her agency’s response to the catastrophic storm that claimed 6,201 lives in the Philippines and damaged or destroyed 1.1 million homes. CRS, which is the American Catholic bishops’ overseas relief arm, currently has ongoing programs in 93 countries throughout the world, and stockpiles emergency supplies in many of them in order to respond to emergency situations. 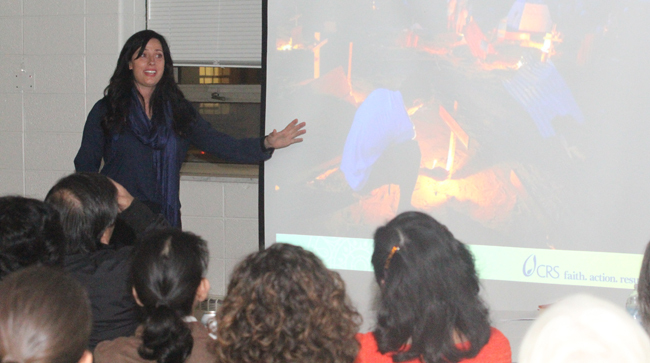 Brennan, who gave presentations on Haiyan one year later at the Archdiocesan Pastoral Center and St. Charles Seminary on Nov. 6, explained this emergency created a special challenge because the supplies warehoused locally in the Philippines had been mostly used up in response to the earthquake the previous month. New supplies were brought in as quickly as possible to provide for immediate needs including temporary shelter, food, pure water and sanitation. Relief agencies and governments from around the world responded to the emergency. CRS was especially effective because of long experience in emergency relief and, in this case, because the Philippines is a predominantly Catholic country with a natural existing network to partner with. “It’s like Starbucks with a church on almost every street,” Brennan said. A team of paid workers was assembled, and this was important because the typhoon not only destroyed property it destroyed livelihoods. During the initial cleanup phase she estimates 4,000 tons of debris was cleared away by the CRS team, including some that could be recycled, and temporary shelter was provided. A program was begun to repair houses that could be repaired and to build new houses if this could not be done. In some cases houses can’t be rebuilt because their location has been judged prone to destruction in future storms and reconstruction is forbidden. 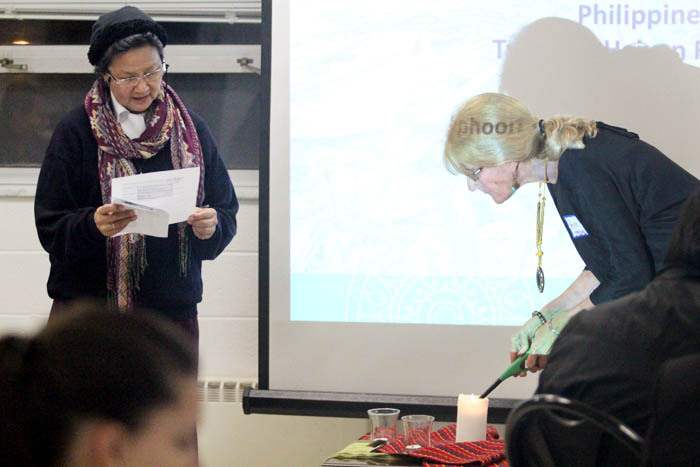 At left Sister Gertrude Borres, R.A., leads a prayer for the participants at the talk as Anne Ayella, director of Catholic Relief Services in the archdiocese, lights a candle. A prime industry in the area was coconut cultivation, but virtually all of the coconut trees were uprooted during the typhoon and because new trees will not mature for five to seven years, the growers were left without an immediate livelihood. Through CRS seeds were obtained for crops that can be grown around newly planted trees to tide the farmers over until coconuts can be harvested again. Because the farmers, fishermen and other workers lost virtually all of their tools, CRS contracted with local blacksmiths to forge new tools, and set up fairs where the people could buy tools and seeds and other necessities of their own choice, paying for them with vouchers that the relief agency supplied. “To obtain a voucher you have to agree to clear your land of fallen trees and plant within a specified time,” Brennan said. 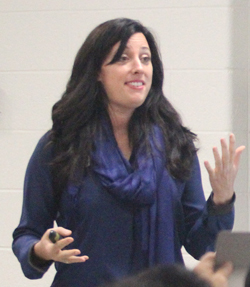 The system of vouchers that supports local businesses and employs local people is a proven method that has been successfully used by CRS elsewhere, according to Brennan. Programs were also set up to train people in such areas as carpentry, livestock development, fisheries and with government approved certification at the end of the courses. Along with the programs to restore livelihood there are new houses designed in accordance with a United Nations’ design for such structures, built in such away that families can easily enlarge them or even move them as future circumstances permit. 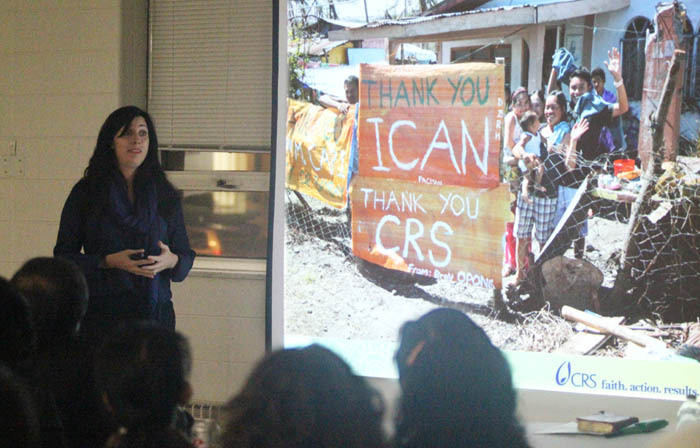 Brennan’s work with CRS takes her around the globe. This year alone she has been to Northern Iraq, Gaza, the Central African Republic, Lebanon and Jordan where she visited Syrian refugees who escaped from the turmoil in their own country. In many of these countries Catholics are a very small minority. “I’ve never experienced hostility toward Catholicism,” she said. “For instance Catholics are a very small minority in India but it is providing a massive amount of education. In the Middle East it is providing medical care and education regardless of creed. The concept of faith-based is understood and appreciated. “You have extremists who are causing upheavals in all lives regardless of faith. Fortunately as a humanitarian organization we haven’t felt any danger in areas where we feel it is safe to work. For more information on the work of Catholic Relief Services visit the website at crs.org.